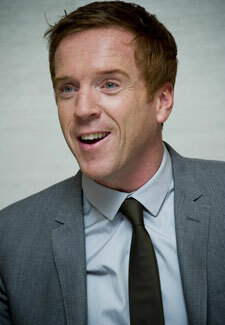 After last week’s shocking episode of Homeland, we can’t wait to see what’s going to happen to Nicholas Brody next. One man who knows is Brit Damian Lewis, 41, who won an Emmy earlier this year for his role as the former US Marine turned terrorist. Damian is married to fellow actor, Helen McCrory, 44, and – when he’s not filming in the States – lives in London with her and their children Manon, five, and Gulliver, four. Here, he talks about playing an American, his dedication to the show and counting the President of the United States as a fan! What do you think is the secret to the show’s success? Of course everyone likes the edge-of-your-seat thriller aspect of it, but the reason it isn’t cartoonish and hasn’t become James Bond-like – though I love James Bond, of course – is because that action is grounded in a political reality. Did you research the role much? I befriended Muslim people both in London and the US who have been very helpful and have welcomed me into their mosques and invited me to join and observe prayer. When I took on the role, I was very clear that if there were going to be easy parallels drawn between Islam and violence, I wasn’t interested in telling that story. It’s not a fair reflection of what’s going on for the majority of people and I felt it would be irresponsible. Do you ever get used to playing an American? At this point, I don’t know what accent will come out when I order coffee in the morning! I stay an American all day long when I’m filming. It’s too confusing to switch in and out of accents. So I go to work as an American, and until my make-up’s taken off at the end of the day, I remain that way. Do you enjoy working with your co-star, Claire Danes? She’s extremely focused – disconcertingly so at times. Claire can be in an extraordinary scene and the director says ‘cut’ and, before you know it, she’s walking back to her chair completely out of character. We hear President Obama’s a fan of the show!